Title: UP 5259 Moves on to mainline. Description: UP 5259 and UP 5282 about to move on to mainline. In the valley behind the units is Huntington yard. Smoke visible in yard is from SD70's waiting on siding. the Burnt River is at flood stage and is working on eroding the bank. The river flows toward you and empties into the Snake River about a mile. Description: Units have just entered the mainline and proceeding east a short distance to signal light before proceeding west on main line. Huntington is just around the cornerout of sight in the background. 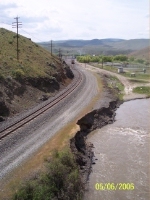 The Burnt River is at flood stage and is eroding the UP road next to the tracks. Idaho is about one mile east of here. Description: Two additional consists of work trains are there--one behind this one (tops are visable) and the other waiting down the line. Description: CSX Q090 at Attica Jct, after just receiving a signal. Title: UP 5259 leads a manifest East. Title: if You Dont Like Budweiser, How about Pepsi? Description: This Union Pacific ES44AC was part of a massive eight-unit light power move consisting entirely of 5200 series GEVOs! Description: Union Pacific C45ACCTE #5259 serves as third-in-consist on the day's Oakland to Marion, AR stack train (KOAMN) as it rolls through Martinez. 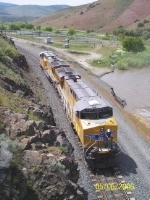 Description: Fernley flyer working Bango Oil South of Hazen on the Mina sub.